If you really want to make this Mother's Day one she will remember forever, show her the Statue of Liberty, Empire State Building, Central Park, and more...from the sky. 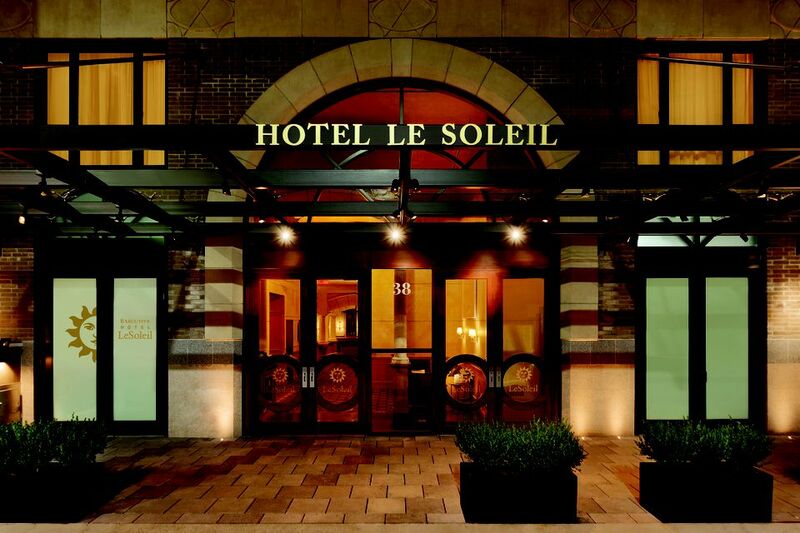 The recently-opened Hotel Le Soleil offers a Take Flight Package that scores you a helicopter tour of New York City when you book a room (others can go along for the ride if they buy tickets for $140). The luxury boutique hotel is located on West 38th Street in the Fashion District and is close to Macy's, so you can add shopping to your trip itinerary—the hotel also offers a Retail Therapy Package that gives you a $25 Macy's gift card and a voucher for the cafe in the hotel lobby. And, if she can't bear to part with Fido, the hotel is pet-friendly. You can toast her after your adventures with a hand-crafted cocktail at the hotel restaurant Trademark Grind & Taste, and then treat her to a fancy dinner. The new East 50th Street location of Empire Steak House is close by and offers a Mother's Day prix fixe menu for $79.95. The former-opera-house-turned-steak-house feels both cozy and elegant with dark wood, satiny tufted banquettes, and a sparkly chandelier. If your mom loves history, fresh ocean air, and/or watching House Hunters, taking her on a historical mansion tour in Newport, Rhode Island is a unique getaway idea. The City By The Sea reinvented itself from a major port town to a summer resort destination for the wealthy (think: the Vanderbilts) during the Gilded Age. Many of the beautiful mansions have been preserved as historical gems and opened to the public. Don't miss Rosecliff, which was the setting for the 1974 The Great Gatsby film. The historic Hotel Viking is located on the same road as these mansions and offers a mansion package that includes accommodations, breakfast for two, tickets for a five-house mansion tour, and valet parking. Recently renovated and celebrating its 90th anniversary this month, the property retains its historic vibes with daily afternoon tea and a garden patio with outdoor fire pit. For a scenic jaunt, try the 3.5​-mile Cliff Walk, a path that runs between the sea and mansion row. Afterwards soothe her feet with a pampering Soul to Sole treatment from SpaFjor that includes a foot rub as well as a rubdown with self-warming oil made from ingredients such as cardamom, jasmine, bergamot, and neroli essential oils. L’Auberge de Sedona | Sedona, AZ. Do some mother-daughter bonding in the great outdoors—without roughing it in any way. Sedona's Red Rock region is buzzed about for it's 'energy vortexes' which are thought to enhance your spiritual energy. Whether your mom thinks this kind of talk is woo-woo or not, she'll appreciate being whisked away to a luxury retreat built on the banks of Oak Creek in the Red Rocks. The L’Auberge de Sedona has landed on 'the best resort' lists for outlets such as Travel + Leisure for its spectacular views of the Red Rocks; creekside, French-inspired restaurant; and spa that offers outdoor treatments. If your mom is feeling adventurous and really wants to immerse herself in the natural world, she might try a moonlit-guided meditation or curated vortex hike. Sometimes nothing lets mom know how much you appreciate her like taking her to a spa—bonus if it's an overnight. One idea: The 10,000-square-feet destination spa at The Ritz-Carlton New York, Westchester in White Plains. Only about 30 minutes away from Manhattan, it has an indoor rooftop pool where you can hang together and award-winning restaurants onsite such as BLT Steak so you don't have to set foot outside of the property for a delicious meal. The spa offers treatments with seasonal themes and ingredients. Make mom feel renewed with the Spring Equinox treatment that includes dry skin brushing, a detoxifying algae wrap and a massage. New Orleans' food scene is a melting pot of French, Spanish, Cajun, West African, and other influences (think: beignets, gumbo, and bananas foster). It also has a thriving music scene and is thought to be the birthplace of Jazz. For a hotel big on Southern ambiance and located right in the famous French Quarter, you might check out The Ritz-Carlton, New Orleans. This Mother’s Day, mom can listen to live entertainment over a four-course menu that includes a seafood buffet, dessert station, and unlimited champagne for $85 per person in their onsite M Bistro. The property is also hosting a special Mother’s Day Tea in their Davenport Lounge. It's $48 per person, will have no shortage of pastries, and includes a cake-decorating demo so you can try making your own for mom next year!